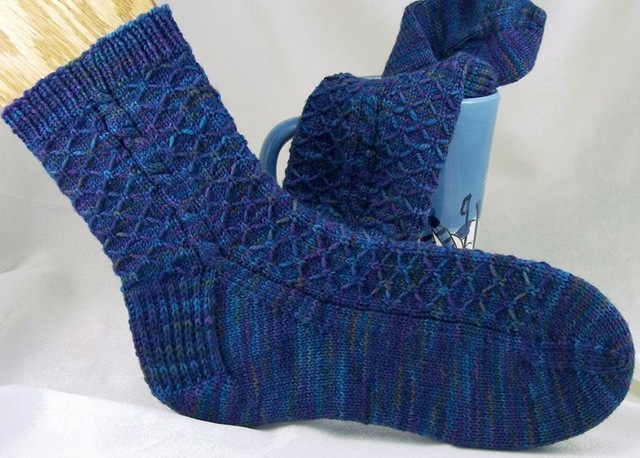 I designed and knit these socks as a gift for my mother-in-law for Christmas. Believe it or not, these socks are the first socks I’ve ever knit for someone else! Not many people are clamoring for hand-knit socks these days, which I think is a shame, but it does mean that I have more for myself. I know that the stitch pattern I used is named “quilted stockinette,” but the pattern really reminds me of a crystal structure instead. These socks are great for hand-painted yarns. 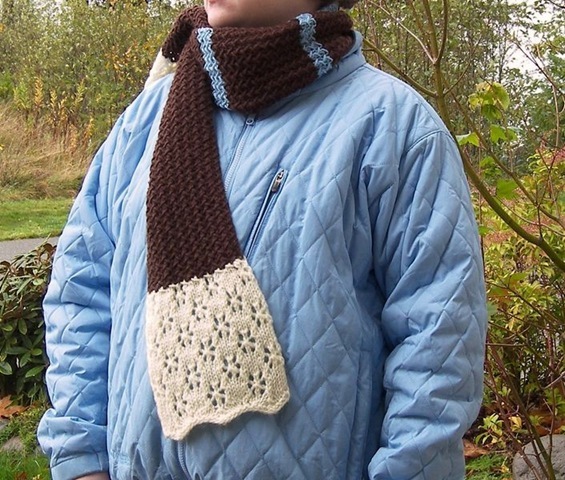 The quilted/crystal pattern breaks up the pooling that hand-painted yarns have a tendency to do. 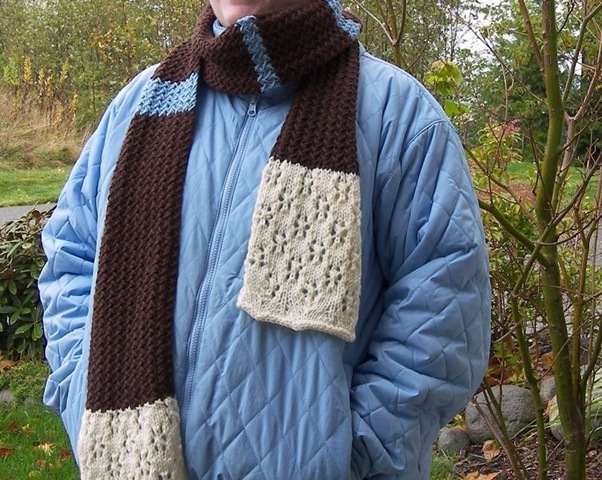 The quilted pattern is also simple to work and easy to memorize, with every other row being plain knitting. 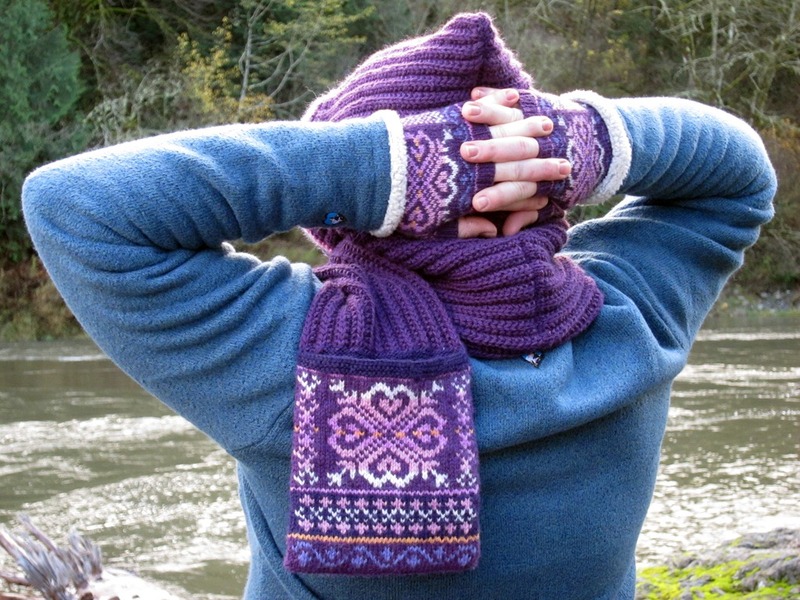 The pattern is created by slipping stitches with the yarn held in front, in order to create a loose strand across the front of the work which is then lifted up by knitting it together with a stitch in a later row. The cables add some visual interest along the leg, but really they’re just there because I love cables. The quilted stockinette sections and cables are worked at the same time, but the number of rows in each are not the same. This means that the quilted pattern starts over before the cable does. Work the first round of each element, then the next round of each, and so on, so that you might be working Round 3 of the quilted stockinette but Round 5 of the cable at the same time. Keep an even (maybe slightly loose) tension with the yarn across the slipped stitches; pulling them too tight will cause the fabric to pucker. 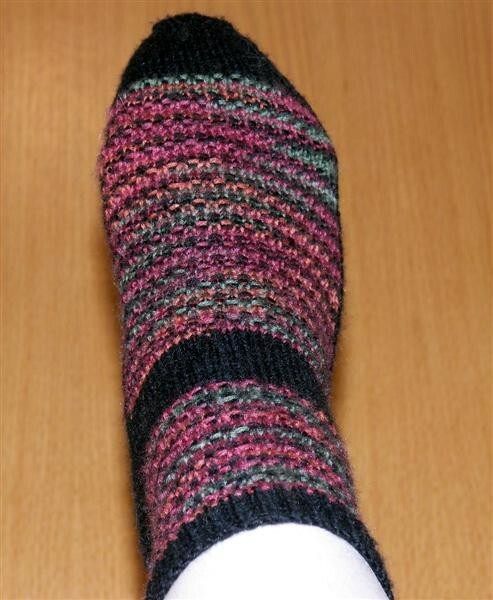 Because slipped stitches are shorter than knit stitches, the instep of the sock will be shorter than the sole. This is corrected somewhat by adding an extra row at the toe to the instep, but will mostly be unnoticeable when the sock is worn. Edit 1/14/08: Edited the cable instructions to make them easier (I hope) to follow. 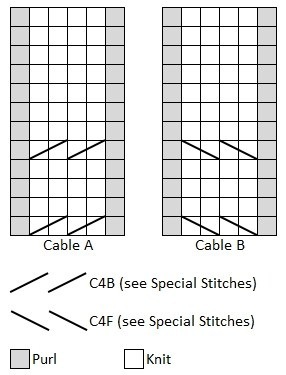 Instead of being part of the written instructions, the purl stitches are part of the cable charts. Also corrected the first round after the ribbing. Sl wyif: Slip stitch purlwise with yarn held in front of work, leaving a strand across the front. Round 1: K2, *sl5 wyif, k1,* end k1. Rounds 2, 4, 6, 8: Knit. Round 3: K4, *Q1, k5,* to last 5 sts, Q1, k4. Round 5: K1, sl 3 wyif, *k1, sl 5 wyif,* to last 5 sts, k1, sl 3 wyif, k1. Round 7: K1, *Q1, k5,* to last 2 sts, Q1, k1. C4F: Slip next two stitches onto the cable needle and hold to the front of the work. Knit the next two stitches, then the stitches from the cable needle. C4B: Slip next two stitches onto the cable needle and hold to the back of the work. Knit the next two stitches, then the stitches from the cable needle. CO 66 stitches and join to begin working in the round, being careful not to twist. Place a marker for the beginning of the round. Ribbing: *K1, p1* to the end of the round. Work for Ribbing for 1″. Set up round: K27, p1, k4, p1, k27, p1, k4, p1. Starting on Round 1 of both the Quilted Stockinette and Cables A and B, work 27 sts in Quilted Stockinette, p1, Cable A, 27 sts in Quilted Stockinette, Cable B. Continue working the Quilted Stockinette and the two cables at the same time until the leg is the desired length. Set up: Work next round as normal, stopping 3 sts before the end of the round, turn. Row 1: Sl 1, p2tog, p30, turn. 32 sts on heel flap. Heel flap will be worked back and forth on these 32 heel stitches. Put other 33 stitches on a stitch holder, spare needle, or scrap yarn. Row 2: *Sl 1, k1* to the end of the row, turn. Row 3: Sl 1, purl to the end of the row, turn. Repeat Rows 2 and 3 30 more times, for a total of 34 rows (17 slipped stitches on each side) ending after row 3. Row 1: Sl 1, k17, ssk, k1, turn. Row 3: Sl 1, k6, ssk, k1, turn. Row 4: Sl 1, p7, p2tog, p1, turn. Continue working 1 more stitch per row, until all stitches have been worked, ending after a WS row. 19 sts remain. 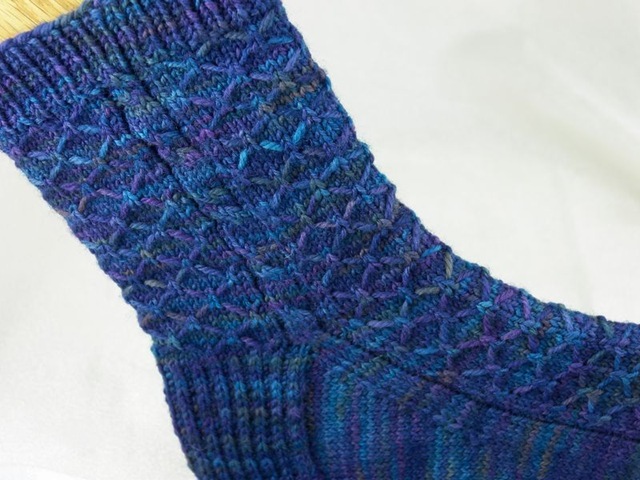 Sl 1 and knit across the heel. Return other 33 stitches, which form the instep, to the needle(s). Pick up and knit 17 stitches along the heel flap, 1 in each slipped stitch. Instep: k2, p1, work 27 sts in Quilted Stockinette, p1, k2. Pick up and knit 17 sts along in the heel flap, k9. Place marker to mark the beginning of the round. 34 sts increased, 86 sts. Round 1: Knit to the last 3 sts before the instep, k2tog, k1, work across instep (k2, p1, work 27 sts in Quilted Stockinette, p1, k2), k1, ssk, work to the end of the round. 2 sts decreased. Round 2: Work even, working instep pattern as established. Repeat Rounds 1 and 2 until there are 66 sts remaining. Continue working instep as established and work sole in stockinette stitch until foot is about 1.5 inches shorter than desired length. Set up: Work to instep, knit across instep, place marker for the new beginning of the round. Round 1: K1, ssk, k to 3 sts before the end of the sole, k2tog, k2, ssk, k to 3 sts before the end of the instep, k2tog, k1. 4 sts decreased. Repeat Rounds 1 and 2 until there are 22 sts remaining. Graft the remaining sts together using Kitchener stitch. Argh. That’s just a small insight into my mind for the last few weeks. Every stitch has been second-guessed and questioned and analyzed. I guess I’ll know the answer when I give my sister the scarf at the end of the month. If I get that face- you know the one, the “oh, it’s… knitted” face- then maybe next time I’ll, well, I don’t know what I’ll do. Of course, there’s always the chance that she’ll love it. My sister is an artist, so she really appreciates handmade items. But appreciating a handmade item and really liking the pattern I created are different things, eh? Lowell thinks it’s a cool scarf, but then he’s neither a knitter nor a teenage girl (thank goodness!) What do you guys think about the scarf? Yea or nay? On a more technical note, the scarf is pretty easy to make. The Herringbone Stitch that’s used for the majority of the scarf is very easy to memorize and pretty fun to do. The scarf doesn’t curl and the wrong side doesn’t look half bad either! 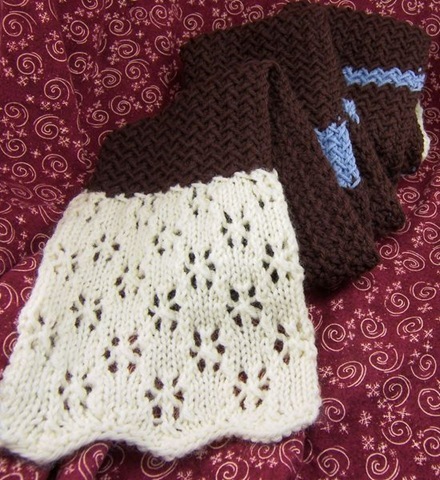 The beginning and ending have a slight chevron edge as well as a pretty snowflake lace pattern. The lace pattern may seem daunting in the written instructions, but it’s really not that bad. By the end of the lace section, you’ll probably have the pattern memorized, then completely forget it by the time you get to the ending section. 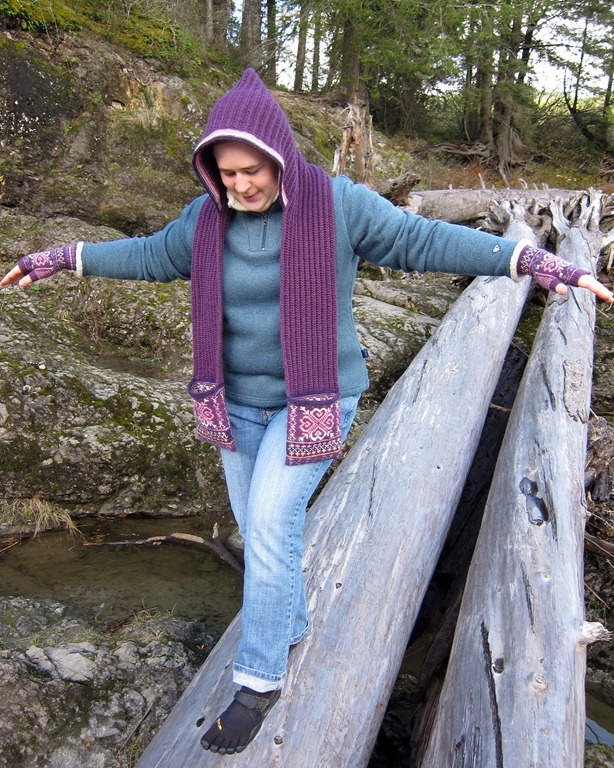 The stripes, of course, can be made any length you want if you’d like a longer or shorter scarf. 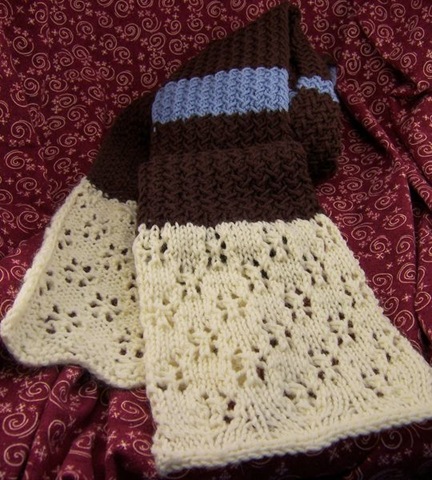 If you make the scarf about 6″ shorter or make the blue stripes or lace sections longer, you can make this scarf with only 1 skein of brown instead of 2. Row 1 (RS): Sl 1, *YO, sl 1, k2, psso* to the end. Row 2 (WS): Sl 1, *YO, sl1, p2, psso* to the end. 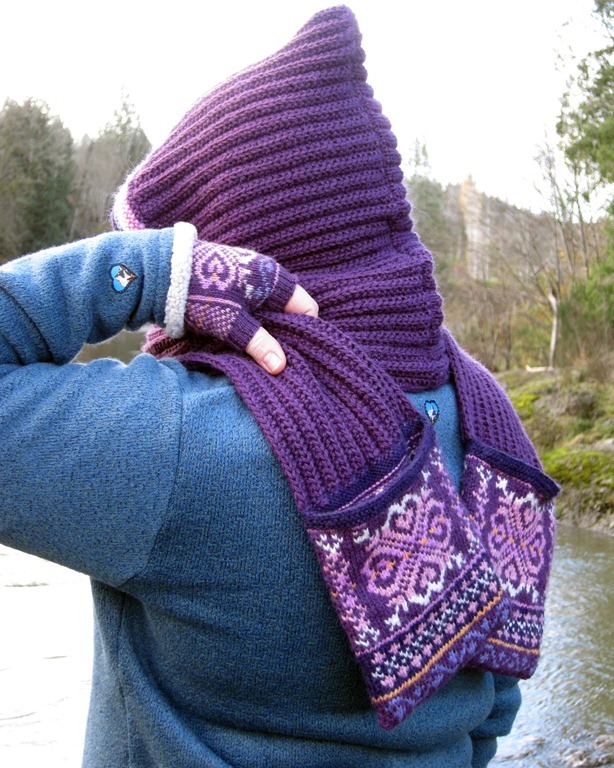 Optional: slip the first stitch of every row (counts as the first stitch) for a neater edge. With smaller needles, CO 31 sts in Natural. Chevron Row 1: Sl 1, YO, k3, sl 1, k2tog, psso, *k3, YO, k1, YO, k3, sl 1, k2tog, psso,* to the last 4 sts, k3, YO, k1. Row 1 (RS): K5, ssk, YO, k1, YO, k2tog, *k3, ssk, YO, k1, YO, k2tog,* to the last 5 sts, k5. Row 3: K6, YO, sl 1, k2tog, psso, YO, *k5, YO, sl 1, k2tog, psso, YO,* to the last 6 sts, k6. Row 7: K1, ssk, YO, k1, YO, k2tog, *k3, ssk, YO, k1, YO, k2tog,* to the last st, k1. Row 9: K2, YO, sl 1, k2tog, psso, YO, *k5, YO, sl 1, k2tog, psso, YO,* to the last 2 sts, k2. Repeat Rows 1-12 2 more times, for a total of 6 rows of snowflakes. Knit 1 row and then switch to Brown. Purl 1 row. Switch to larger needles. Work Herringbone Stitch in Brown for 14 inches, ending with a WS row. Switch to Blue. Work Herringbone Stitch for 2 inches, ending with a WS row. Switch to Brown. Work Herringbone Stitch for 9 inches, ending with a WS row. Switch to Blue. Work Herringbone Stitch for 1 inch, ending with a WS row. Switch to Brown. Work Herringbone Stitch for 4 1/4 inches, ending with a WS row. Switch to Blue. Work Herringbone Stitch for 1 1/4 inches, ending with a WS row. Switch to Brown. Work Herringbone Stitch in Brown for 14 inches, ending with a WS row. Switch to smaller needles. Knit 1 row, knitting each YO through the back loop. Join Natural and purl 1 row. Beginning on Row 7, work Snowflake Lace three times through (total of 6 rows of snowflakes). Ripple Row 1: Sl 1, YO, k3, sl 1, k2tog, psso, *k3, YO, k1, YO, k3, sl 1, k2tog, psso,* to the last 4 sts, k3, YO, k1. Repeat the Ripple Row 1 once more. Weave in ends. Block lace sections, pinning the peaks at the beginning and end to keep them pointy. I bought some KnitPicks Essential in the Tuscany colorway a little while ago. Well, 10 months ago, actually. Anyway. I fought with myself, who wanted to buy something in blue or purple, and my other self who said I should expand my palette and get something in red, which I hardly ever do. I’ve had this conversation with myself before. And I imagine you have too. It almost always ends up with something red, orange, olive, etc in my closet or stash that I never wear or use. I like those colors, I do, they just don’t call to me like blue, purple, and green. So, I bought Tuscany instead of Blue Violet and it’s been sitting in my stash ever since. Later, I bought some Black, thinking I would use it in a project for DH, but that never happened. Recently, I had to clean up my stash room- I mean our guest room- and saw those two balls sitting next to each other. Beautiful! I was flipping through Favorite Socks, as I often am, and I was in love with the look of the Hidden Passion Socks. 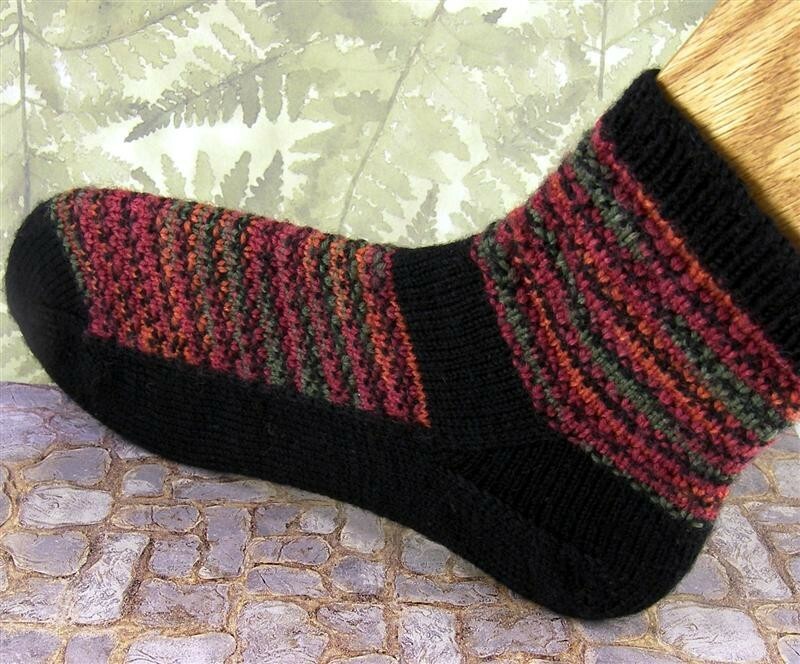 The stripes, the solid color sole, the band around the ankle… But I’m not that fond of illusion knitting- wait! Inspiration! After quickly glancing over the instructions for the Hidden Passion Socks, I decided that they were too complicated and that I could obviously make the same thing simpler. (Ever said that to yourself?) Well, I knit up the first sock with surprisingly few hiccups, using the aforementioned Tuscany and Black. Very pleased with myself, I looked back at the Hidden Passion Socks instructions. They were almost identical to my "simpler" instructions! So much for that. The Tuscany colorway reminds me of the leaves in autumn in my native Virginia. I really miss those beautiful colors here in Seattle. Hence, naming these socks Shenandoah, despite the difficult spelling, lol. 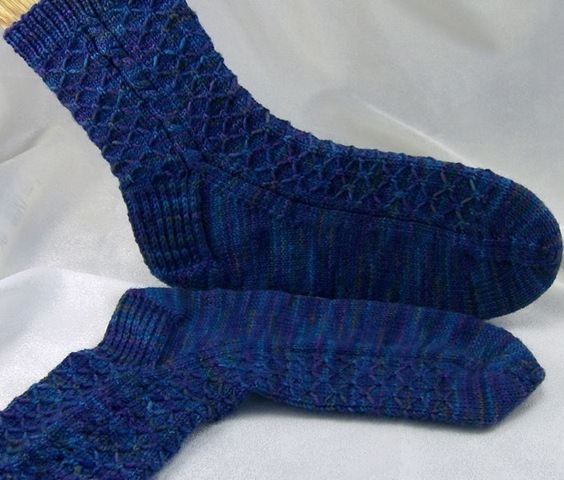 I love the construction of these socks, so unusual and interesting. I’m planning on knitting up a few other designs based on the same principles, so I think these socks are going to be the first in a series. 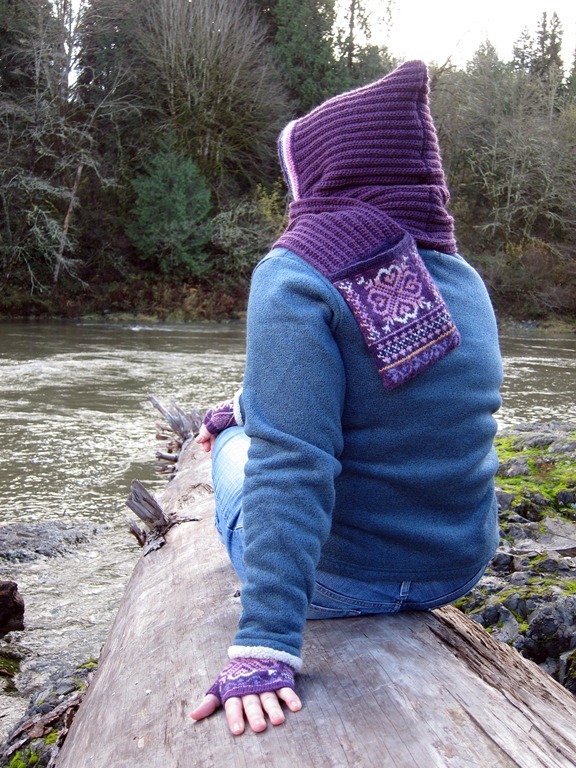 Shenandoah uses a slip stitch pattern on the foot and leg. 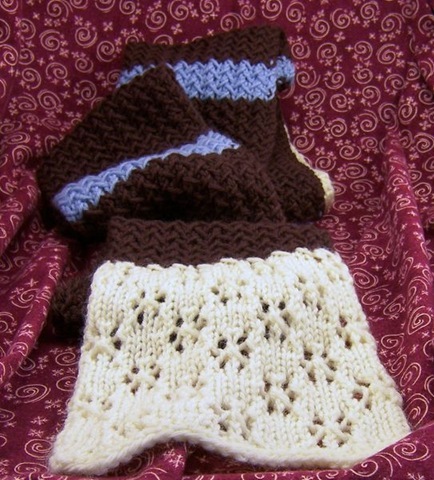 Slip stitch is an easy colorwork technique, because you’re only using one color per row. 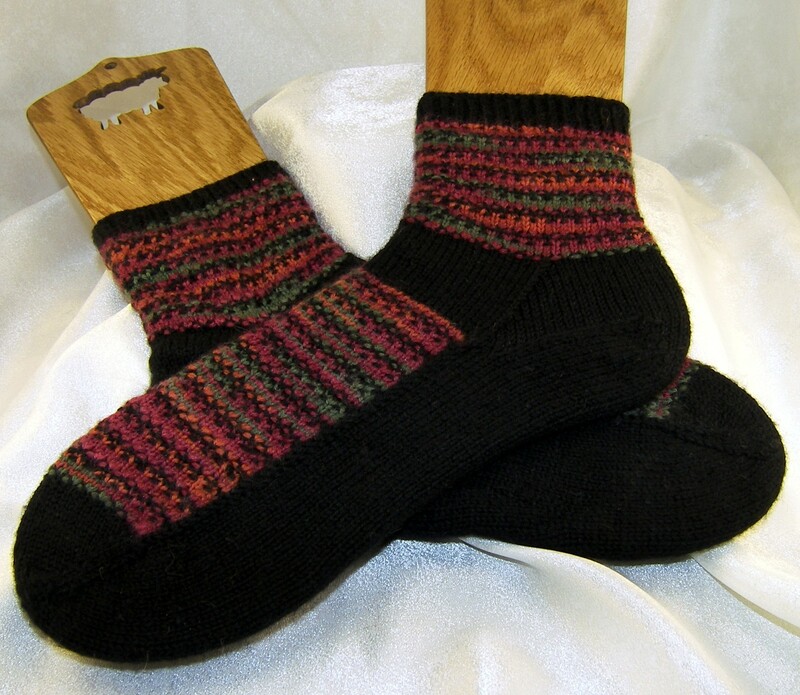 Shenandoah is essentially a toe up sock, but isn’t knit in the round between the toe and heel. 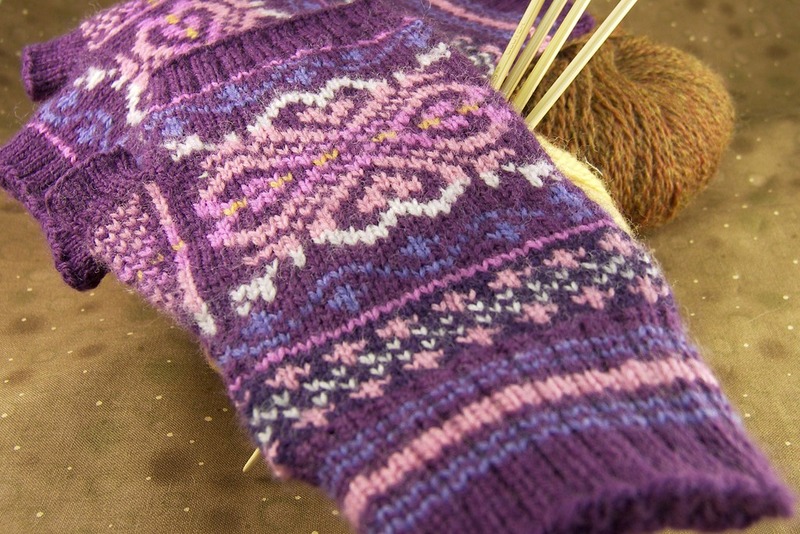 After completing the increases for the toe normally, the instep stitches are worked separately. Then the sole is knit while joining it to the instep. 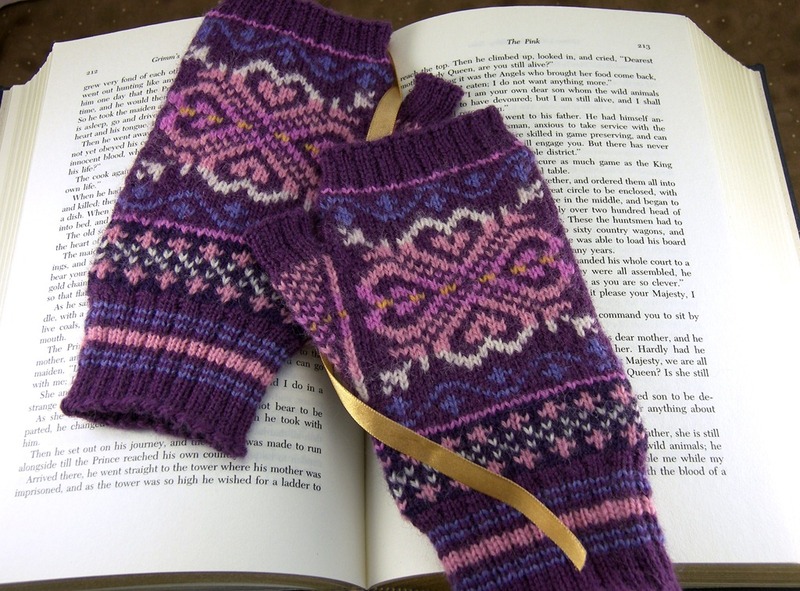 A "heel flap" is knit, turned, and stitches are picked up along the flap, just like a top-down sock. The gusset is decreased, then the stitch pattern resumes for the leg. 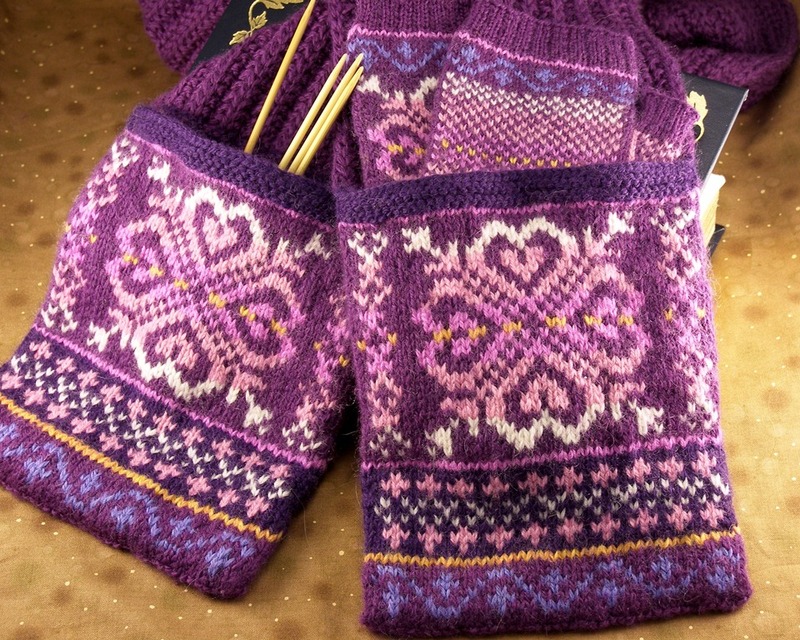 I swear I wrote down every detail while I was knitting these… but when I went to type it up, some of those details weren’t there. I’ve tried to be as accurate as I can, but if you find any mistakes or are confused by anything, please let me know! wyif: with yarn held in front, as in "slip 1 st with yarn held in front"
wyib: with yarn held in front, as in "slip 1 st with yarn held in front"
The starting needle (Needle 1) is the top/instep. The second needle (Needle 2) is the bottom/sole. Round 2: K1, M1, knit to last st on Needle 1, m1, k2, m1, knit to last st on Needle 2, m1, k1. 4 sts increased. Repeat Round 1 and 2 until there are 64 sts total, 32 sts on each needle. Place the sole sts (Needle 2) on a stitch holder or scrap yarn. You can also pull the sts to the cable section of your circular needle, but I find that the dangling needle ends get in the way. You will now be working back and forth on Needle 1. Tip: Pull slipped stitches tight on the needle to reduce holes. Row 2: Sl 1 wyif, purl all sts. Row 1 and 2 count as the first 2 rows of the slip stitch pattern for the first repeat. Join CC. Don’t cut MC, just twist the two yarns together on the WS before each knit row to carry the MC yarn upwards. 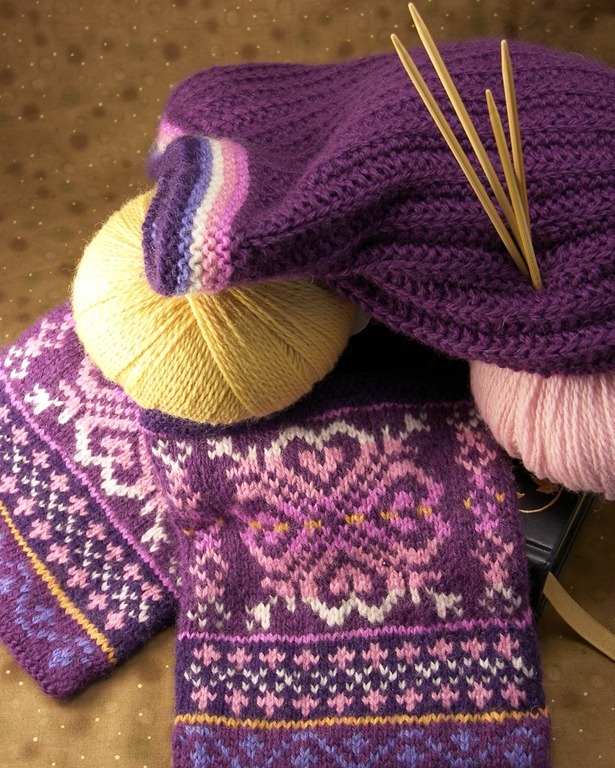 To twist the yarns, place the carried yarn over or under the working yarn and knit first stitch as normal. The MC yarn should be caught between the CC yarn and the work. When you’re done, you get a nice dotted line of MC yarn up the right-hand side of the work. Make sure that the last MC and CC slipped sts are snug; they can become loose waiting until the next MC or CC row, but don’t pull them too tight. Start Slip Stitch Pattern (Foot) on Row 3. Odd rows are RS, even rows are WS. Row 1 (MC): Sl 1 wyib, k1, *sl 1 wyif, k1* until 3 sts before the end, sl 1 wyif, k2. Row 2 (MC): Sl 1 wyif, purl all sts. Row 3 (CC): Sl 1, k1, *k1, sl1 wyif* until 3 sts before the end, k3. Row 4 (CC): Sl 1 wyif, purl all sts. Row 5 (CC): Sl 1 wyib, knit all sts. Row 6 (CC): Sl 1 wyif, purl all sts. Repeat these 6 rows until instep measures 7.25”, or 2.25” shorter than desired foot length, from the tip of the toe, ending after a WS row. Cut MC and CC yarns. 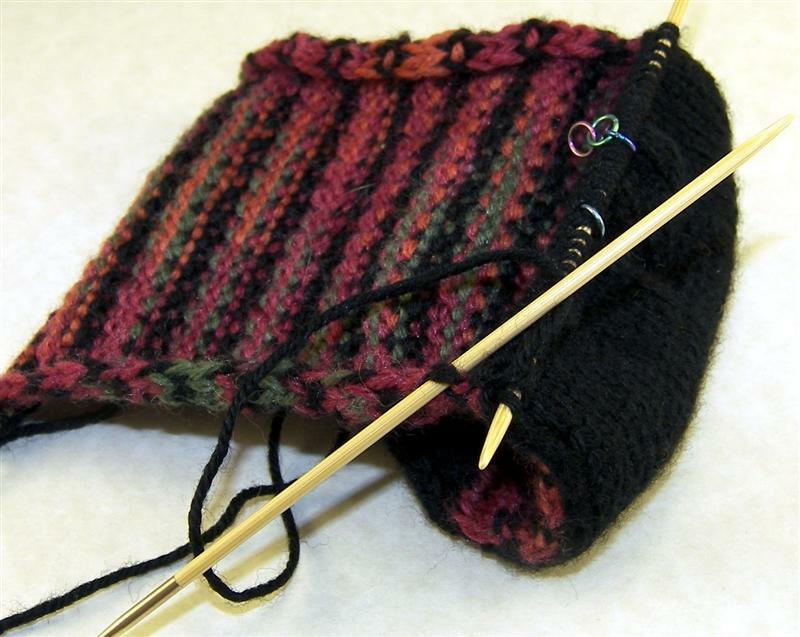 Row 1 (RS): With the left needle, pick up the two loops of the first slipped stitch on the instep and move them (correctly mounted) to the right hand needle. Knit the two picked up loops together with the first stitch on the needle. Knit to 1 st before the end of the needle, SSLK. Row 2 (WS): Sl 1, purl to last st, SSLP. Row 3: Sl 1, knit to last st, SSLK. Row 4 (WS): Sl 1, p27. Place last 4 sts onto the stitch holder or scrap yarn. 1 st decreased. 28 sts on needle. Row 5 (RS): Sl 1, k23. Place last 4 sts onto the stitch holder or scrap yarn. 24 sts on needle. These 24 stitches will be the bottom of the heel; this would be the heel flap if we were making a top-down sock. Row 6 (WS): Sl 1, purl all sts. Row 7 (RS): Sl 1, knit all sts. Repeat Rows 6 and 7 until the sole measures 9”, or .5” shorter than desired foot length, from the toe of the sock, ending after Row 6. Row 1: Sl 1, k16, ssk, turn. Row 2: Sl 1, p8, p2tog, turn. Row 3: Sl 1, k8, ssk, turn. Repeat Rows 2 and 3 until all sts have been worked, ending after Row 2. 10 sts remain. Knit across all sts on needle. 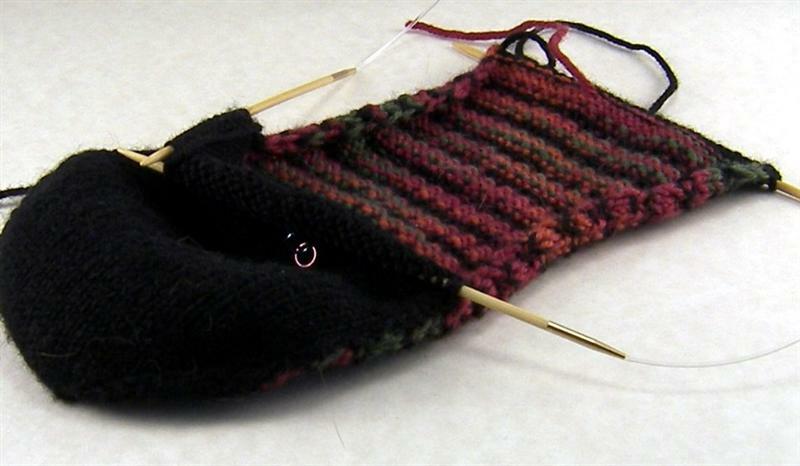 Pick up and knit 1 st in each slipped stitch along the “heel flap.” Return all held sts to needles. Place a marker between the last picked up stitch and the first held stitch. Knit across 4 held sole sts, all instep sts, and the other 4 held sole sts. Place a marker between the last held stitch and the first picked up stitch. Pick up and knit 1 st in each slipped stitch along the “heel flap.” Knit 5 stitches from the heel and mark as the beginning of the round. Row 1: Knit to 3 stitches before the first marker, k2tog, k1. Knit to the second marker, k1, ssk, knit to the end of the round. 2 sts deceased. Repeat Rows 1 and 2 until 64 sts remain. Join CC. Row 1 and 2 count as the first 2 rows of the slip stitch pattern for the first repeat. Start Slip Stitch Pattern (Leg) on Row 3. Switch to smaller needles if desired. Work 15 rounds k1 p1.